AMO Abbott Whitestar Signature Phacoemulsification Ophthalmology Surgical . New Life Scientific, Inc. The Abbott WhiteStar signature microsurgical unit can be utilized for ophthalmic procedures using phacoemulsifaction of the lenses to treat cataracts. Using ultrasonic handpieces and dual pump suction, the surgeon can remove the lenses with a minor incision for less patient discomfort and reduced recovery-time. New Life Scientific technicians have evaluated this instrument for basic signs of functionality by powering the instrument, noting that it passes initialization from the self-test screen, visually raising the IV stand, and that all included accessories communicate with the surgical unit. 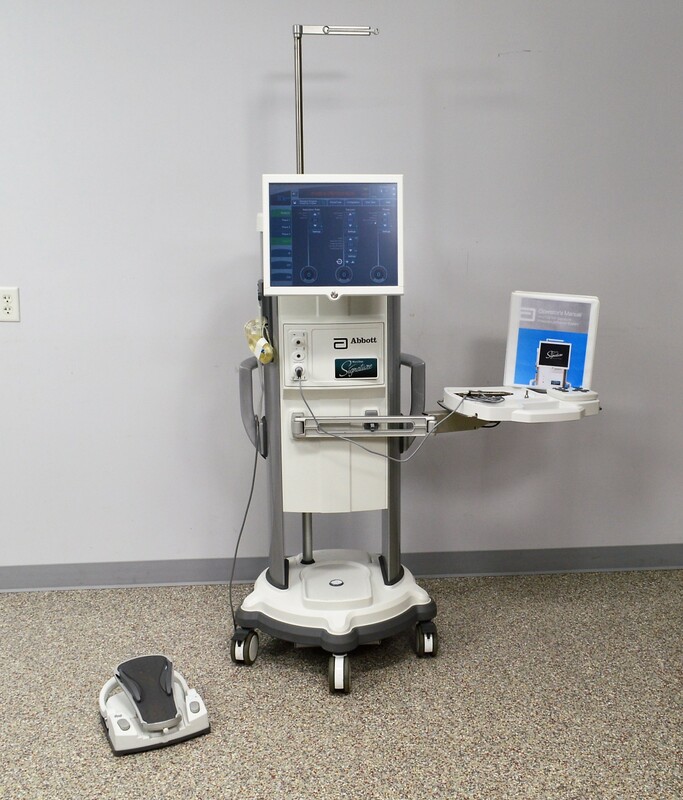 The advanced foot pedal and remote have docking stations that offer wireless charging on the surgical unit. The seventeen inch LCD panel touchscreen is fully-functional along with the remote and foot pedal. New Life Scientific does not specialize in ophthalmic equipment and does not keep the handpieces or consumables in stock; however, NLS did acquire a number of consumables and handpieces with this instrument. For more information about the accessories and product please see the links and table below. This instrument is due for the annual PM which New Life Scientific recommends that the buyer have performed by an authorized technician. The technicians have spoken with the manufacturer which offers service/re-certification and multi-year service contracts for reduced per serivce rates. * For all warranty details and additional product information, please contact New Life Scientific. This used WhiteStar ophthalmic surgery instrument is in excellent cosmetic condition, but may have minor signs of wear and age. There are several nicks to the paint and scuffs.